From the railroad and oil booms to undeniable Spanish Colonial architecture to one of the most renowned gas stations on the coast (yep, that’s right! ), this itinerary takes you back in time. Goleta’s roots go way, way back, and many of the historical moments and places that came to define the coastal California town can still be experienced today. If you’re a history buff like we are, or just want to see some old time aspects of central California, check out these famous historical notes while you’re in town. In 1871, William Whitney Stow—a legal magnate and influential political figure whose most notable achievement was creating Golden Gate Park in San Francisco—purchased the incredible rich, lush land that became known as Rancho La Patera. Stow bought the land (1,100 acres) for his son for a whopping $28,600. The fertile soil quickly became home to almond and walnut tree orchards, and in 1875, 3,000 lemon trees were planted. Once the headquarters of Rancho La Patera, the beautiful original Stow House is now home to the Goleta Historical Society. You can visit this Goleta cornerstone (and get a wonderful waff of the lemon orchards!) with a visit on Saturdays and Sundays from 1:00 – 4:00pm. Guided tours of the Stow House begin at 2:00 and 3:00pm. The railroad has been a storied part of California’s history since settlers started laying down tracks. Don’t miss the opportunity to take a trip to train travel’s early days with a visit to the South Coast Railroad Museum. This fun and interactive experience focuses on the history, technology, and adventure of the railroad’s history, with a special emphasis on the Southern Pacific Railroad. At the center of it all is the Goleta Depot—an actual stationhouse built in 1901! Train enthusiasts of all ages will love a ride on the Goleta Short Line miniature train and the museum’s handcar. Continue the tour of Goleta’s history with a visit to the Sexton House. Built by Joseph and Lucy Foster Sexton, the Sexton House was built in 1880 and was listed on the U.S. National Register of Historic Places in 1992. A prominent community member, Joseph was best known for his nursery businesses, which literally flourished in Goleta from 1852 until his death in 1917. Located near Old Town Goleta, the house is a beautiful example of Italiante style by architect Peter J. Barber. The Sexton House is open to the public to view on the property of Pacifica Suites Hotel, 5490 Hollister Ave. Finally, make sure to fill up—on your gas station history that is. It might sound odd, but believe us when we say that the Barnsdall Rio Grande Service Station is a small, but architecturally important reminder of simpler times. While the structure now stands alone on an empty lot on Hollister Avenue, it was once a prominent aspect of the area’s booming oil industry, built in the beautiful Spanish Colonial revival style. 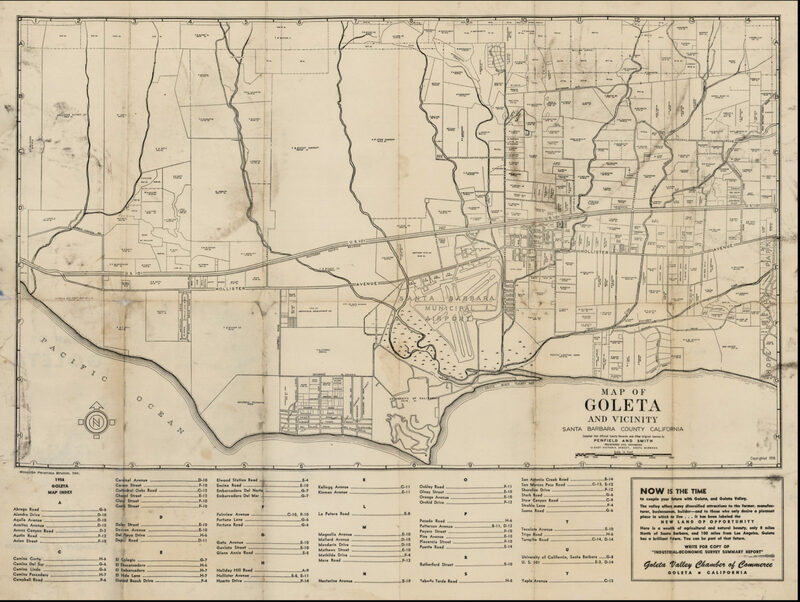 In 2015, the property was gifted to the Goleta community for restoration and preservation. Swing by for a look back in time.